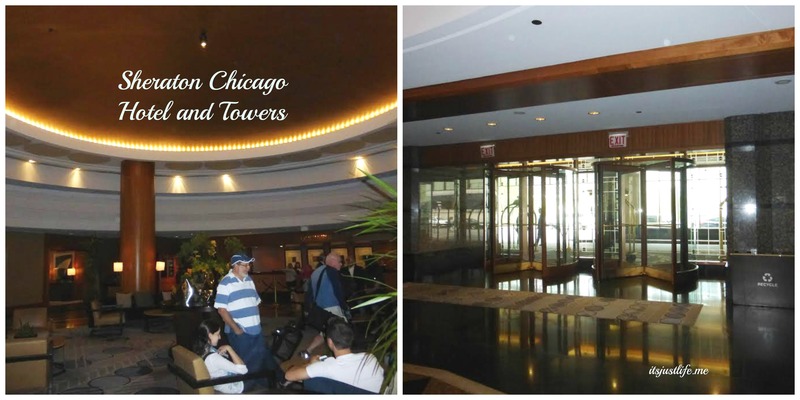 I was provided with a hotel stay at the Sheraton Chicago Hotel & Towers to facilitate my review. All thoughts are 100% honest and my own. A group of North Iowa Bloggers takes on the Windy City and of course they need a first rate place to stay. The Sheraton Chicago Hotel and Towers was generous to our group and had 2 fabulous rooms ready for us when we arrived in Chicago. Did I mention they were adjoining? That was perfect as we wanted to be able to all be together as much as possible. 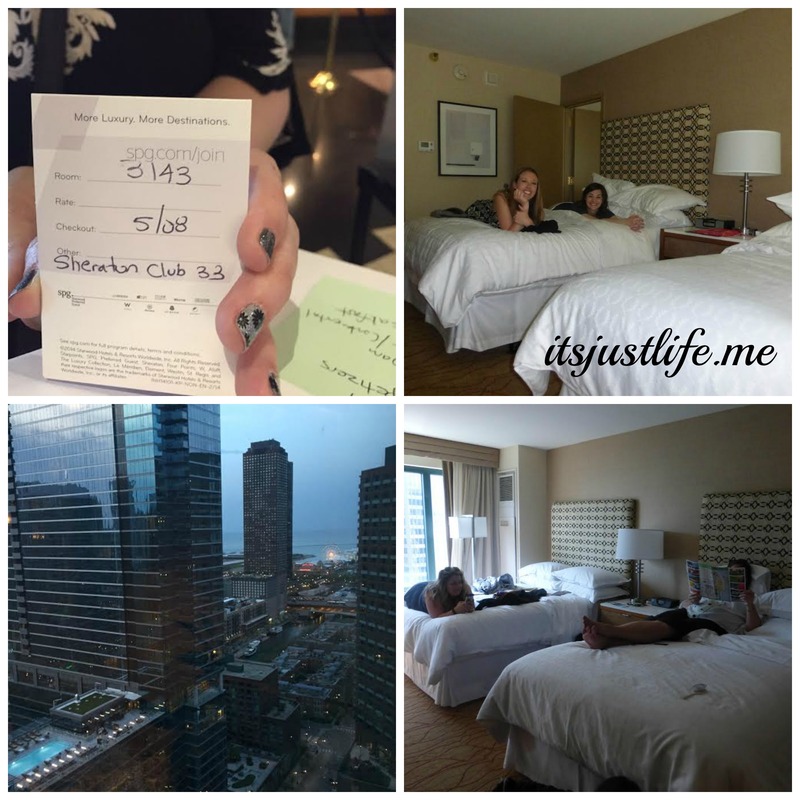 We were excited and ready to take on the city and were thrilled to find that the hotel was in such a great location. Check in was quick and easy and maps were shared with us as well as the promise of any assistance that was needed. The hotel is located in the heart of downtown on the Chicago River, within walking distance of Navy Pier, Magnificent Mile shopping, Millennium Park, the Loop business district and all of the other local favorites that make Chicago the perfect destination. The views were fabulous and the rooms were just perfect for our group of 8 bloggers. We drew names to determine what room we would be in and I got to be with Donna of DonnaHup.com, Laura of Life on SkyView Farms and Leslie of The Gym Mom. They were perfect roommates and we loved our room. Our “team” was named Bloggers Rock because well—they do. With that many women we needed towels and housekeeping soon set us up with lots of great towels and we were set for our stay. The beds were comfy and even though we were only there for one night we felt like we had the royal treatment the entire time. The hotel had graciously allowed us access to the Club Lounge which is open 24 hours a day with beverages and light snacks available at all times. 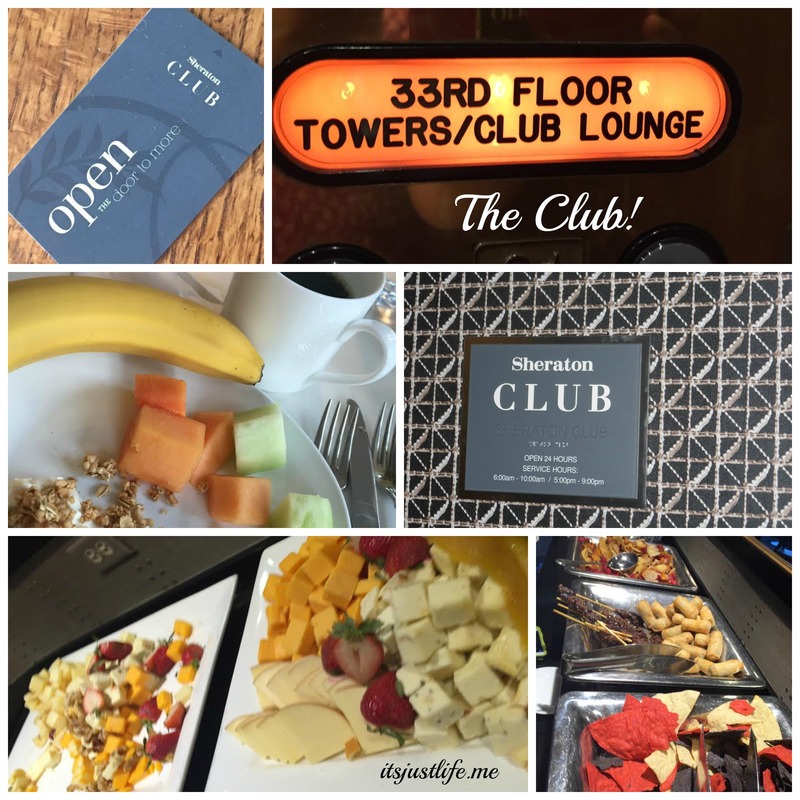 During breakfast hours and dinner hours there are breakfast items and appetizers and the 8 of us took advantage of both of those because we loved being in “The Club”. While we did not explore the hotel much because we were so busy exploring the city we were dazzled by the beauty of the lobby, the flowers, the decor and the employees were all top notch and attentive. There are 5 onsite restaurants that all looked incredible but we only had so much time and so many meals we were going to be eating while in Chicago so we had to prioritize a bit. We were not disappointed with anything about the stay and I would definitely choose this hotel for a future visit because of the fine treatment we received when we visited. 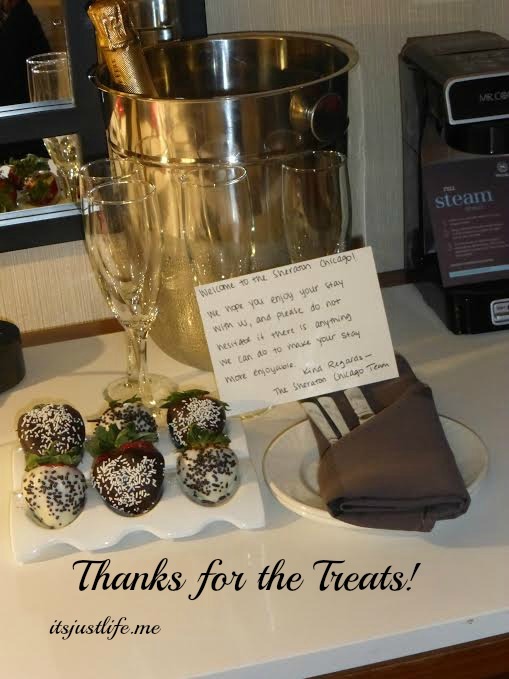 When we came back to our rooms after our sightseeing on Thursday night we were thrilled to find chilled champagne, bottled water and chocolate covered strawberries in both rooms as a welcome to Chicago gift. They didn’t last long and we were so impressed with the way they went above and beyond to welcome us. One tip if you stay and have children. Do not allow them to move the snack items or drinks in the refrigerator if you do not plan to eat or drink them as they are monitored with sensors that detect the movement and then your room will be charged. Imagine your surprise upon check out with a huge additional cost tagged onto your bill because your toddler loved rearranging those snacks. 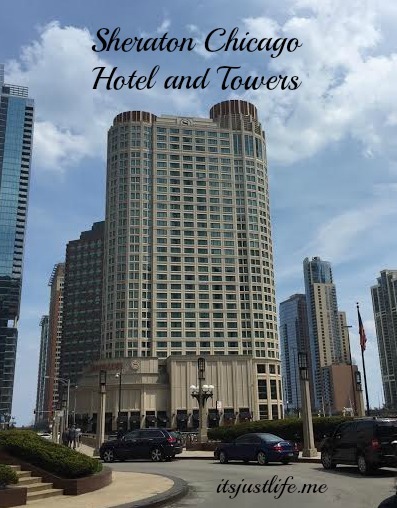 I loved the top notch experience we had at The Sheraton Chicago Hotel and Towers and would definitely love to return for a longer visit again with my husband. The hotel offers special discounts and specials for extended stays as well as AAA discounts so there is certainly a package available to suit every traveler’s needs. Booking online is easy or you can always access their contact information and phone numbers by going to their website here. Thank you to all who made this stay possible and for the wonderful experience that we enjoyed. It’s Just Life — Finding the Extraordinary in the Ordinary receives free products for review purposes. All opinions expressed are my own and were not influenced by any form of compensation. This disclosure is done in accordance with the Federal Trade Commission 10 CFR, Part 255 Guides Concerning the Use of Endorsements and Testimonials in Advertising. 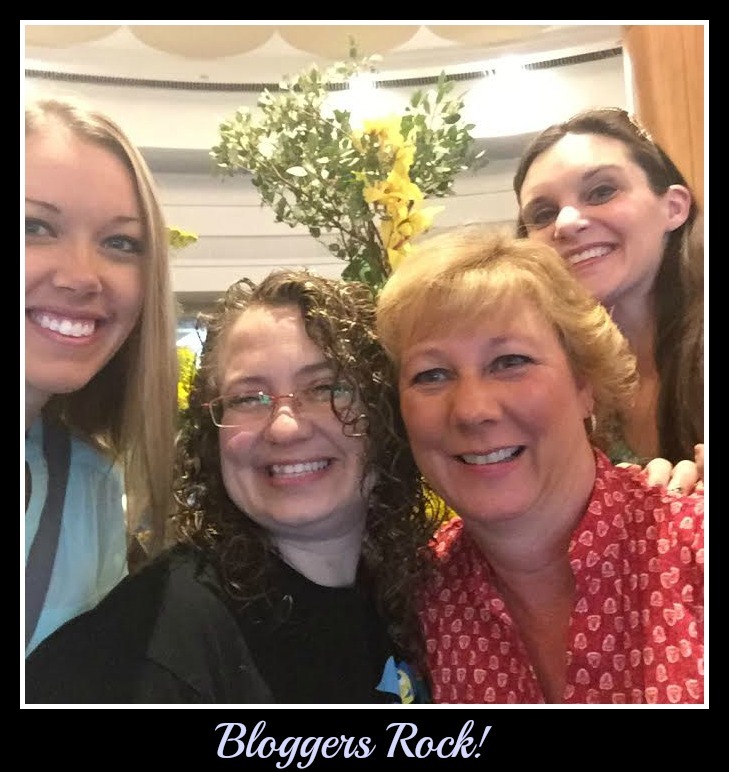 Our #BloggersRock room was the best if I do say so myself 😉 It was so much fun!! I love your photos! It’s a pleasure clubbing with you. What was the other room’s name? I like Bloggers Rock and this hotel! I forget what the other room was…….I will have to ask Jeni! this looks like so much fun!! I hope I get to do this one day. It really was a lot of fun. We had a great couple of days in Chicago—such a great place to visit.